Posted on January 21, 2019 at 8:54 pm. 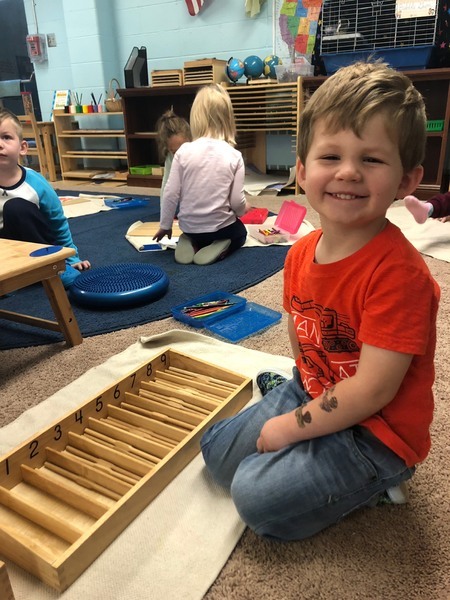 Posted on January 14, 2019 at 12:58 am. Posted on December 21, 2018 at 6:57 pm. 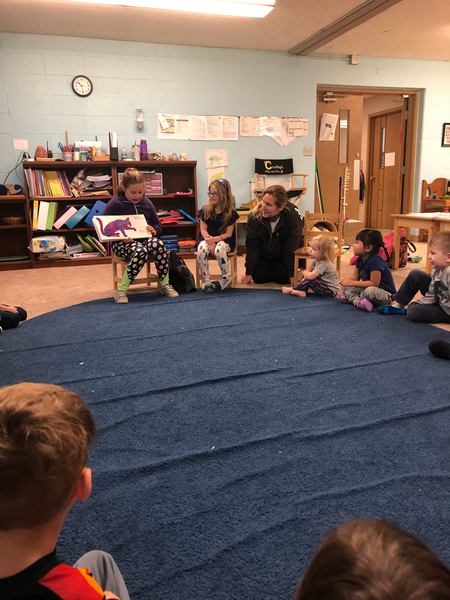 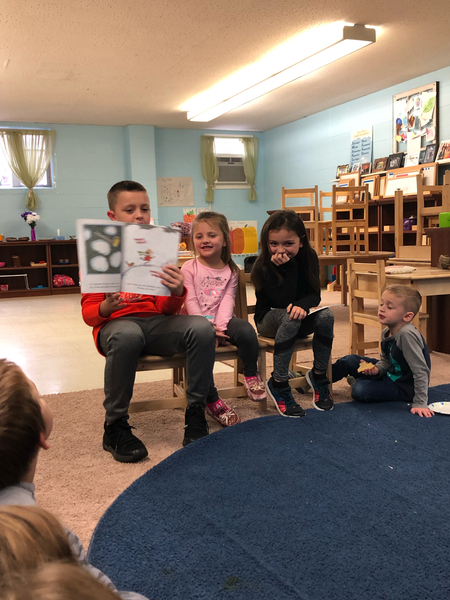 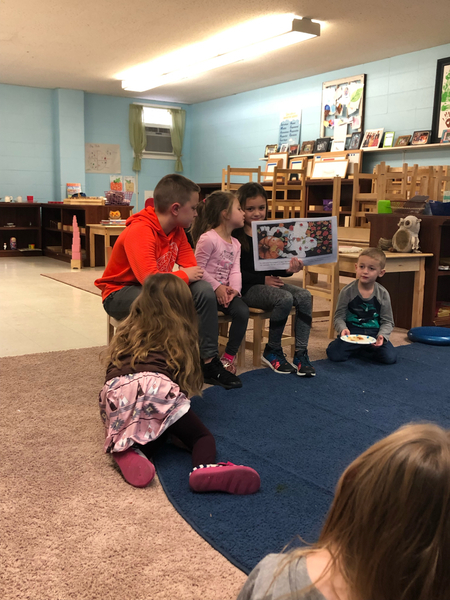 Over the past couple of week the children read a lot of holiday books and did a lot of different crafts. 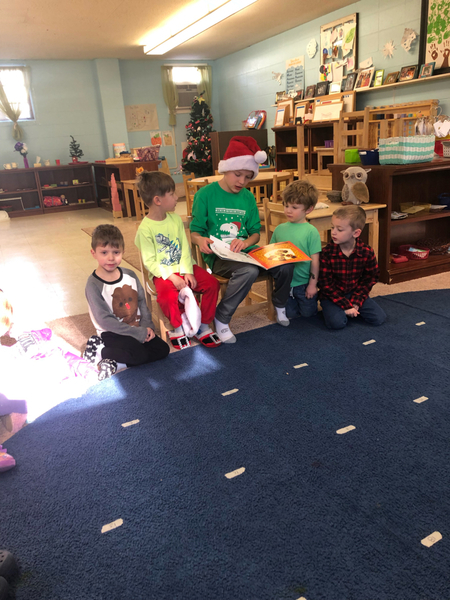 I am so proud of how hard they worked during our Christmas Show practices. 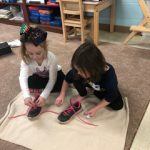 They did such a great job on their performance last Friday! 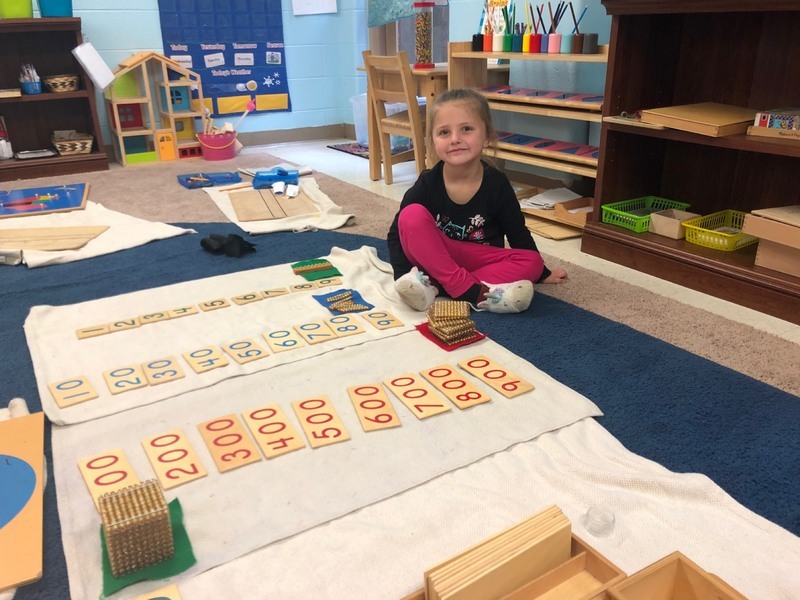 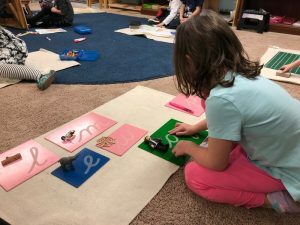 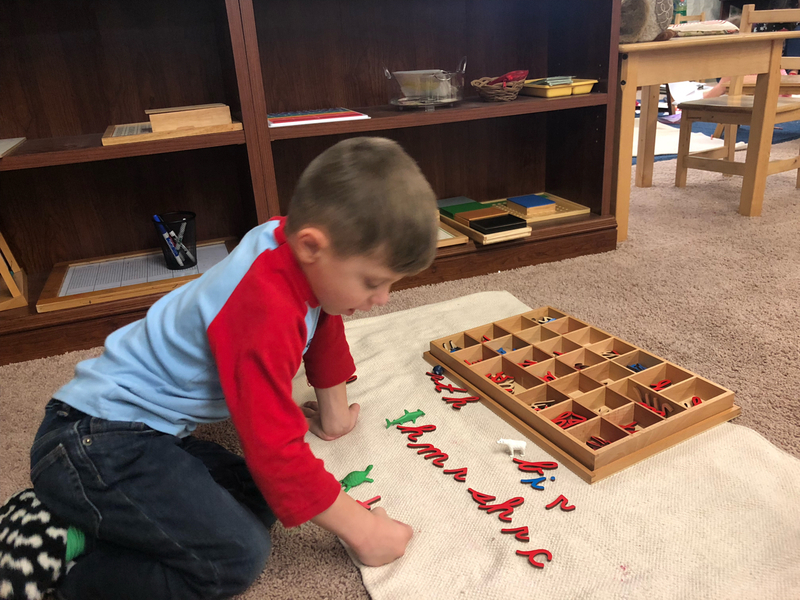 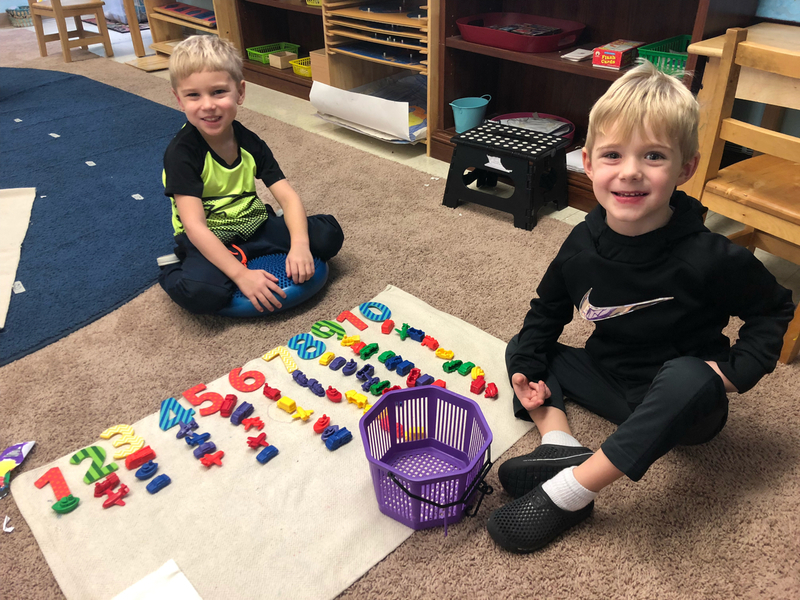 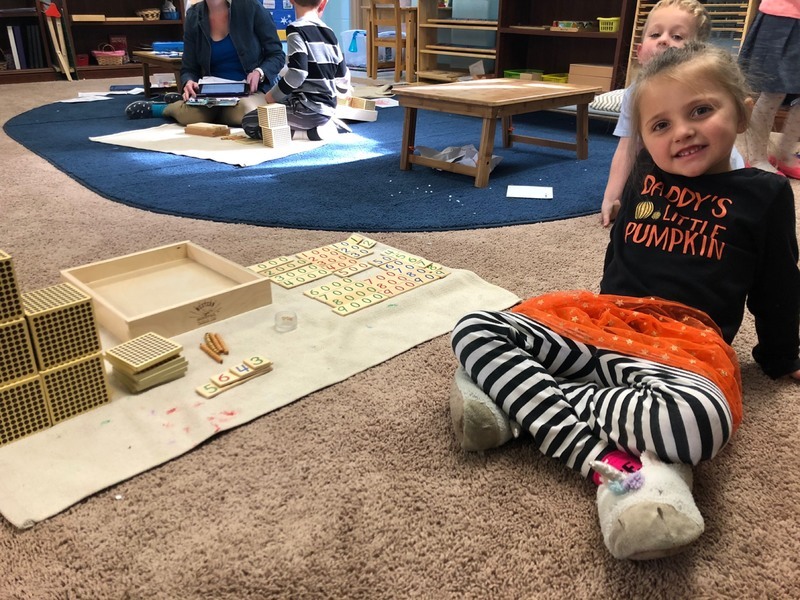 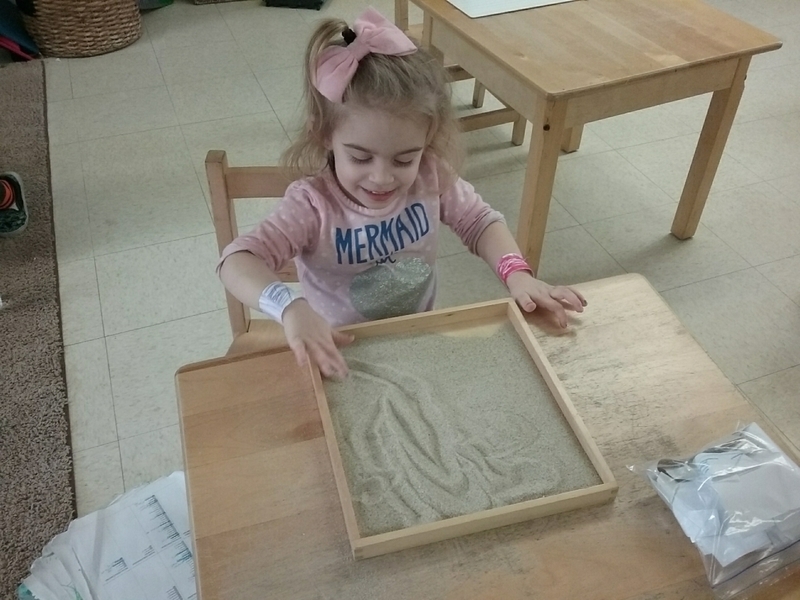 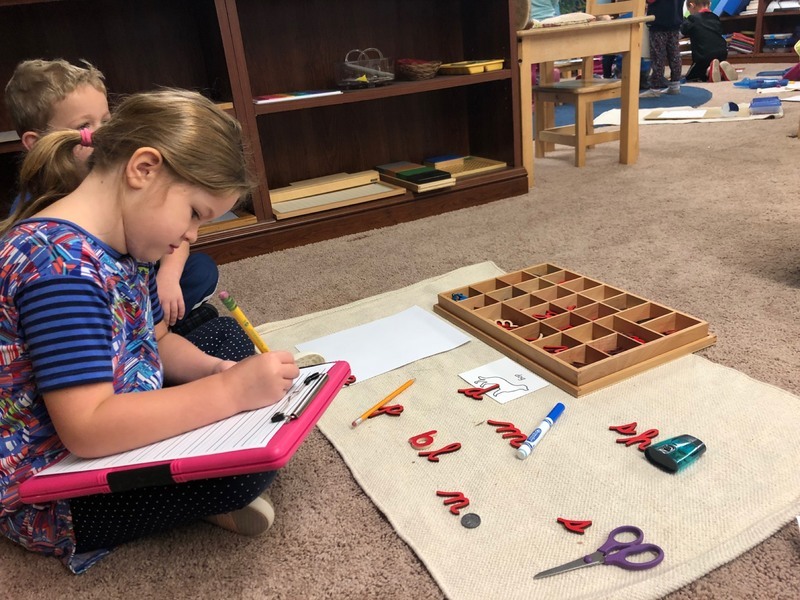 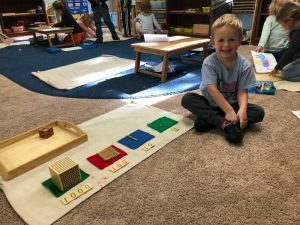 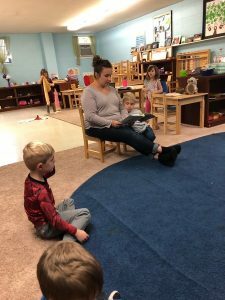 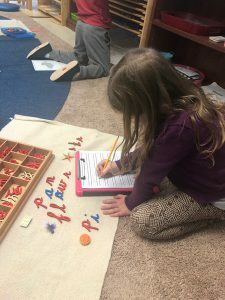 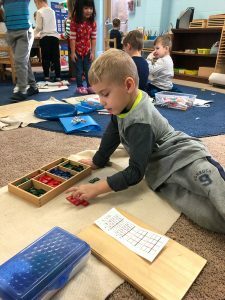 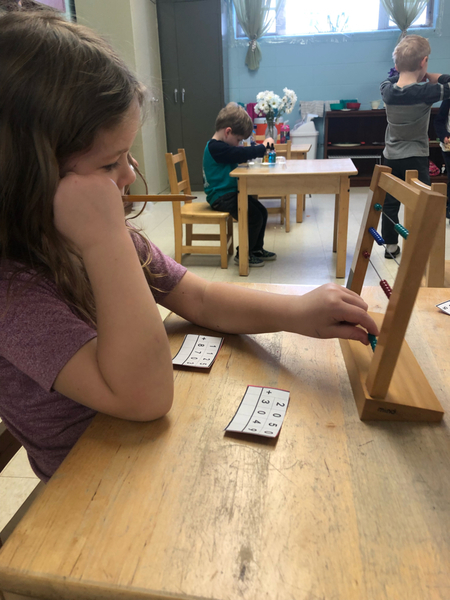 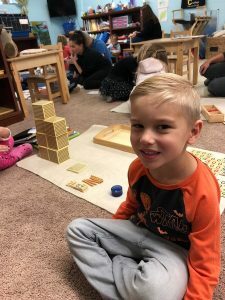 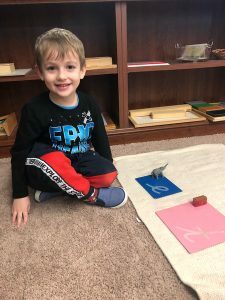 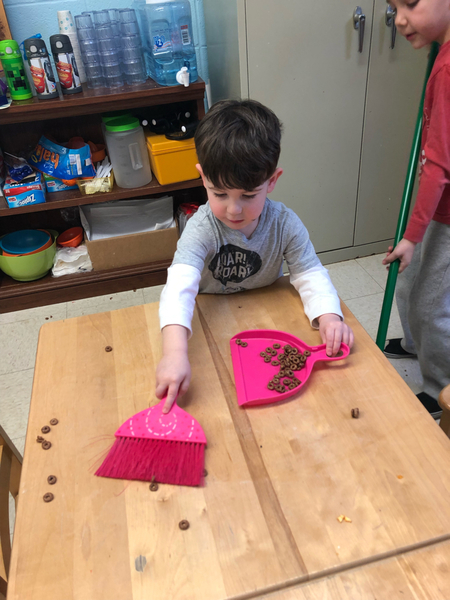 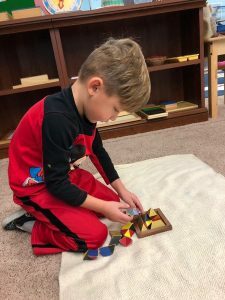 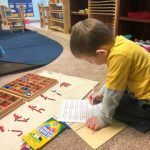 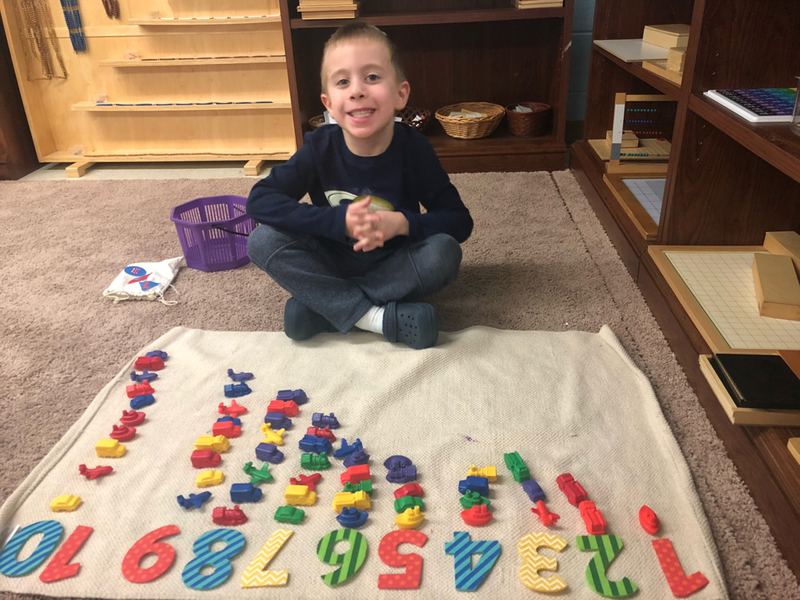 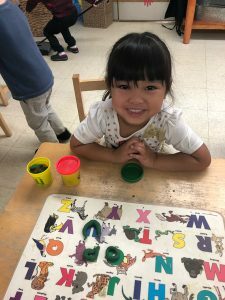 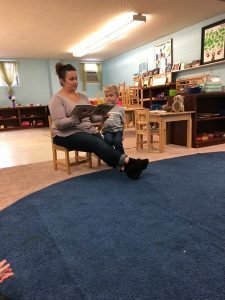 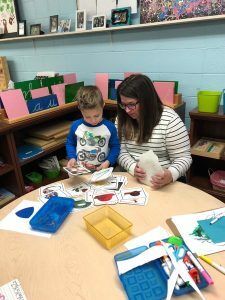 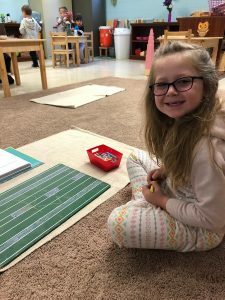 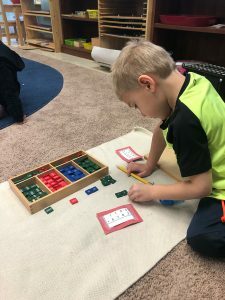 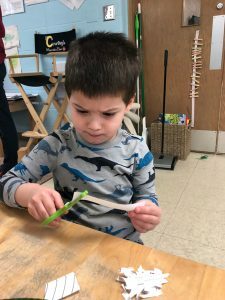 Sandpaper Letters: This child is tracing and identifying the sounds of the letters ‘p’ and ‘t’ and connecting the sounds with the initial sounds of different objects like purse and turtle. 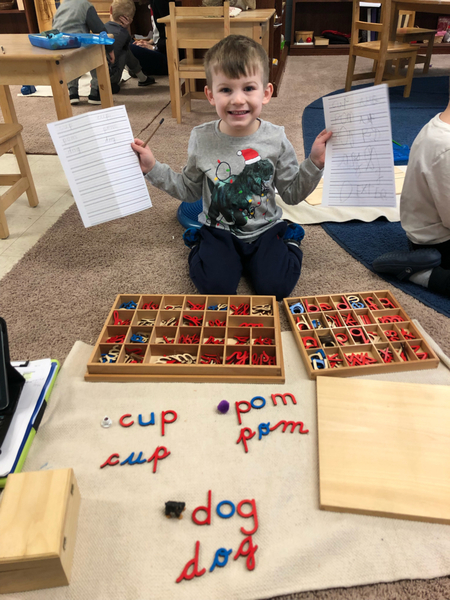 Movable Alphabet: This child is saying the words of different objects and phonetically spelling them:cup, dog and pom. 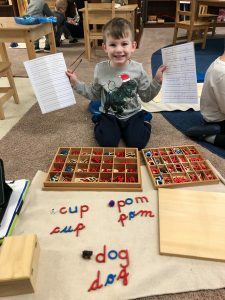 He used both the print and cursive movable alphabet so that he could compare them. 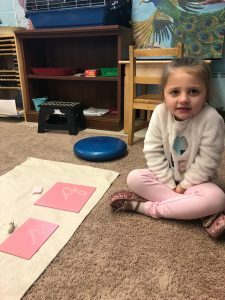 Rhyming Cards: This child is identifying and matching the rhyming object pictures. He is able to understand and hear when two words sound the same. Posted on December 7, 2018 at 6:45 pm. 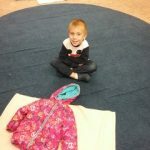 Over the past week the children started practicing for their Christmas Show multiple times a day. 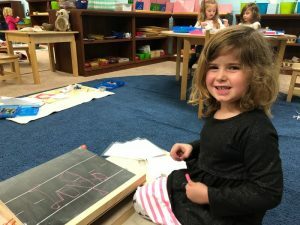 This will be their main focus for the next few weeks. 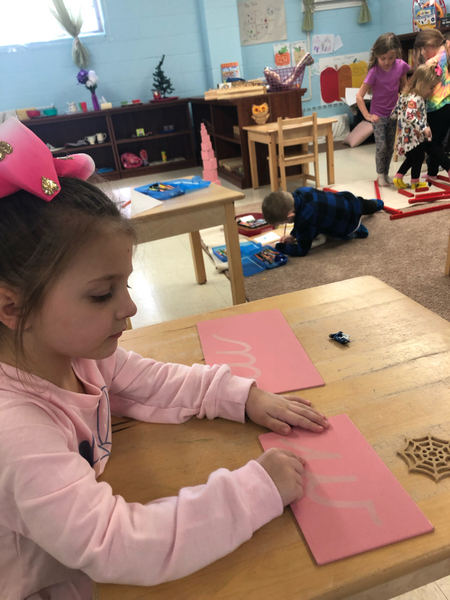 We are doing a Christmas Tree theme. 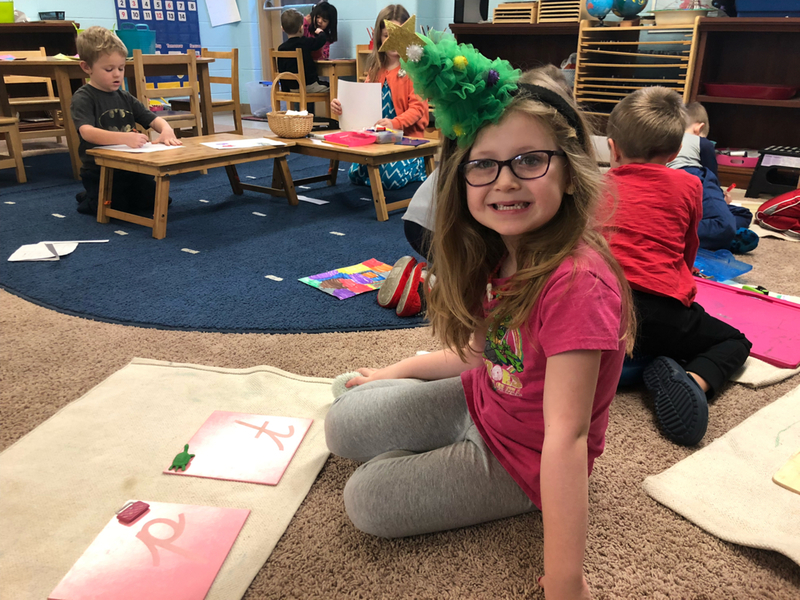 Feel free to dress your child up in anything Christmas Tree related for the show next Friday and practice singing the songs “Rockin’ Around The Christmas Tree” and “O’ Christmas Tree” with them! Sandpaper Letters: This child is tracing and identifying the sounds of the letters ‘r’ and ‘q’ and connecting the sounds with the initial sounds of different objects like rabbit and quilt. Movable Alphabet: This child is saying the words of different objects and phonetically spelling them: pan for pan, flowr for flower, pi for pie and str for star. 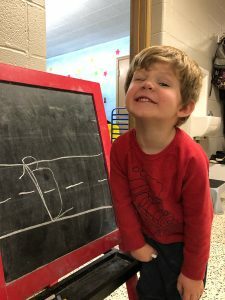 Cursive Chalkboard Writing: This child is practicing writing the uppercase cursive B on a chalkboard. 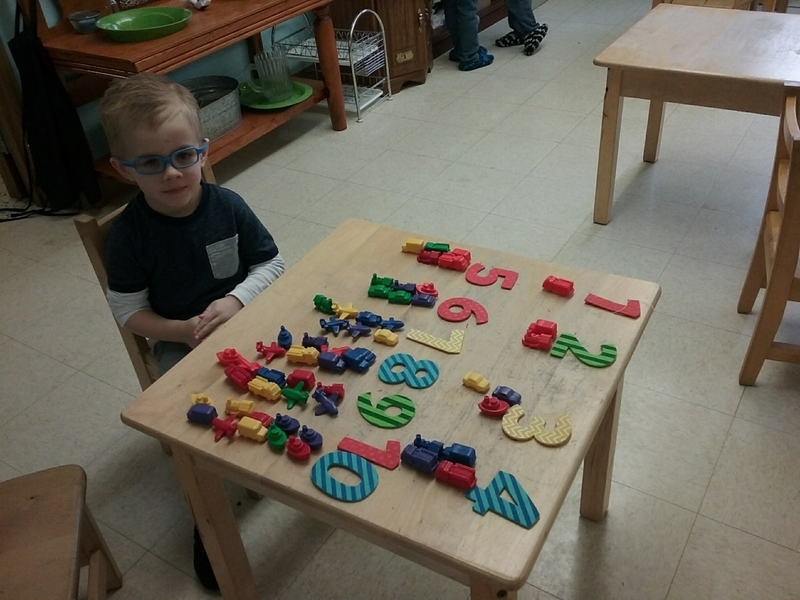 He is developing multiple skills involving his eyes, arms, hands, memory, posture and body control. Cards and Counters: These children are demonstrating their knowledge that each number is made up of separate quantities. 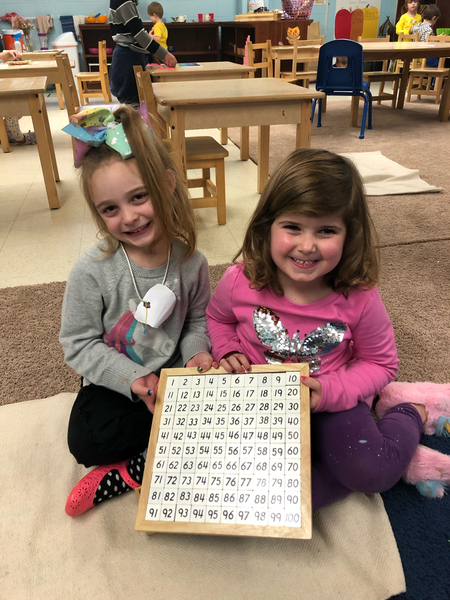 They are also able to visually see the sequence of numbers and how many separate units go together to form each number. 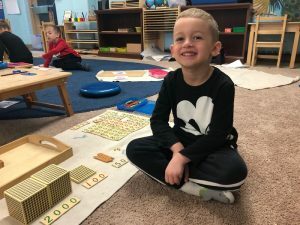 Posted on December 3, 2018 at 7:24 pm. 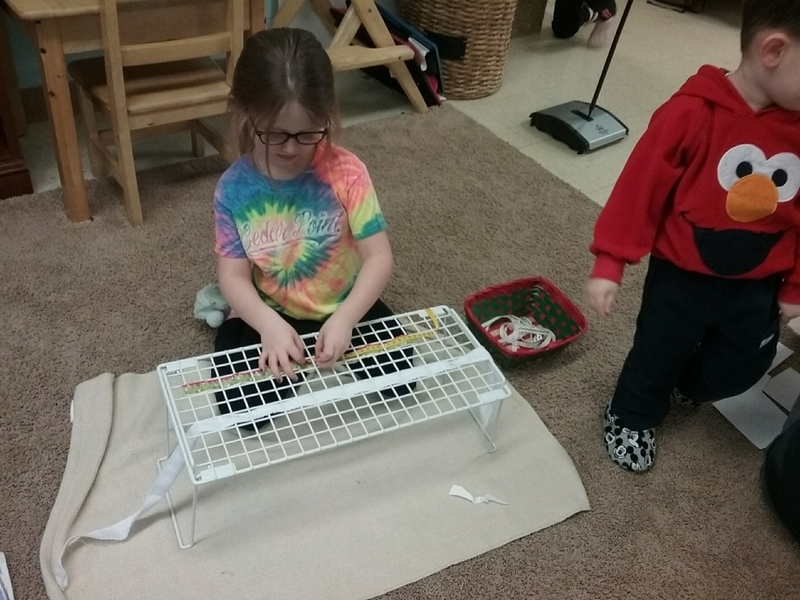 Over the past week the children started practicing for their Christmas Show multiple times a day. 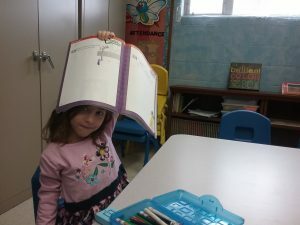 This will be their main focus for the next few weeks. 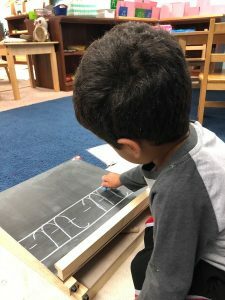 Sandpaper Letters: This child is tracing and identifying the sounds of the letters ‘e’ and ‘t’ and connecting the sounds with the initial sounds of different objects like elephant and train. Movable Alphabet: This child is saying the words of different objects and phonetically spelling them: rth for earth, bir for bear, hmr shrc for hammer shark and trdl for turtle. 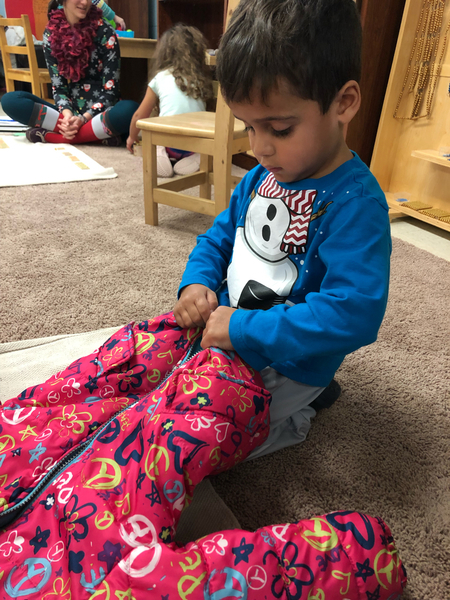 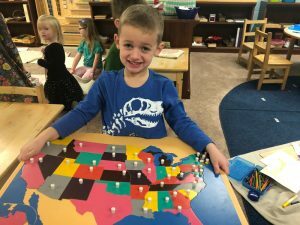 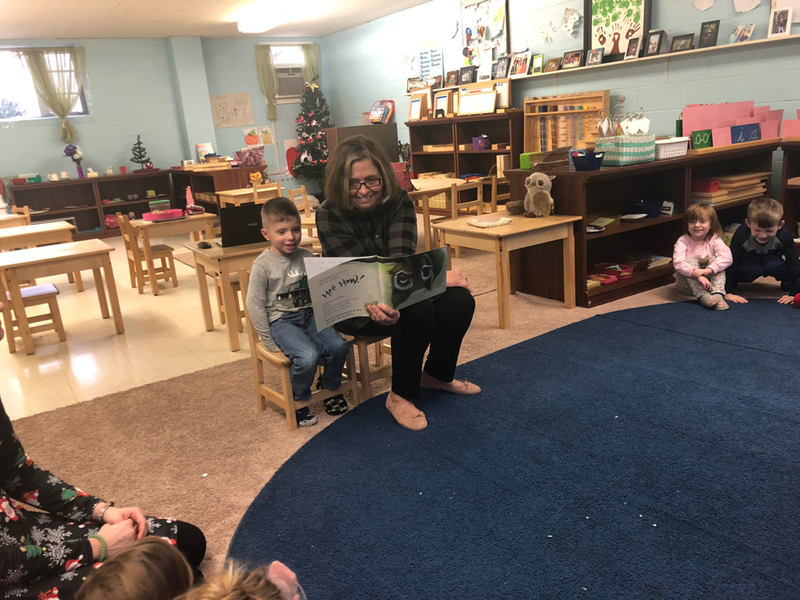 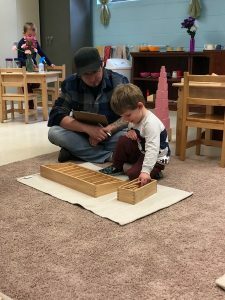 Tying: This child is learning how to care for himself while developing a sense of independence and refining his fine motor skills and coordination of movements to successfully tie the shoes. Play-dough Letters: This child is developing her fine motor skills while also learning how to form the letters of the alphabet. 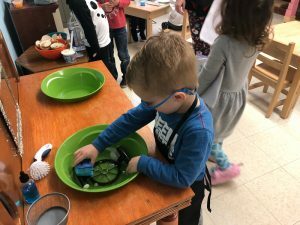 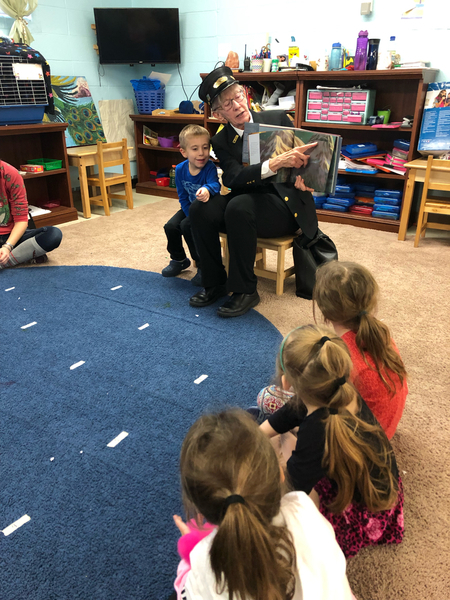 The past couple of weeks we talked about Thanksgiving and being thankful. The children shared what their families do for Thanksgiving and learned that we all have our own traditions. 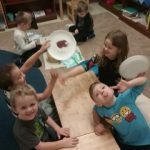 We talked about why the Pilgrims and Indians ate a meal together. 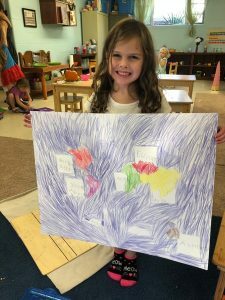 Each child shared what they were thankful for to create a classroom thankful turkey. 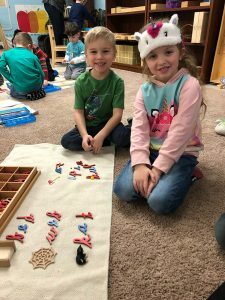 We got a lot of fun responses. We also talked about the Pilgrims and Indians. 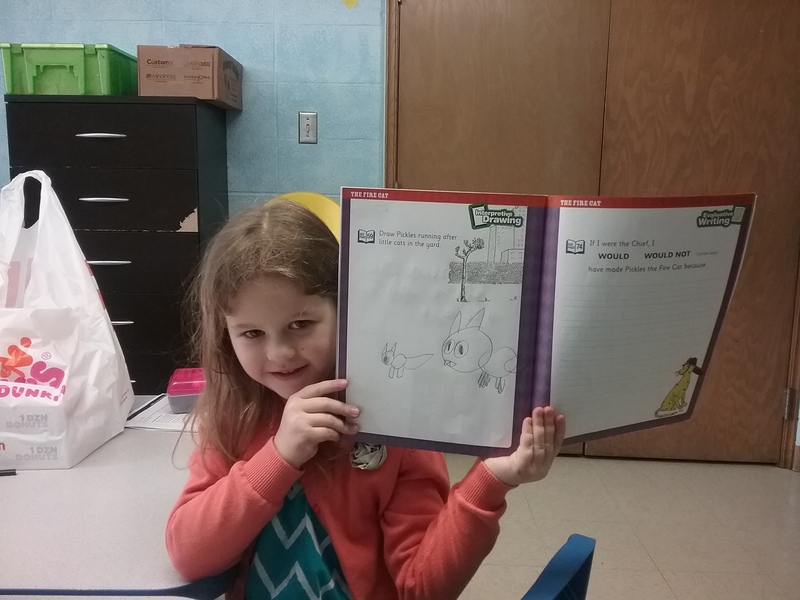 The class found out the Pilgrims came from England to our country for religious freedom. 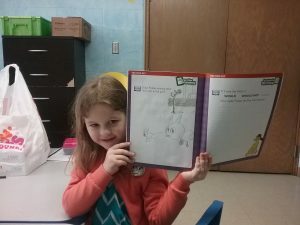 We read books about what the Pilgrims experienced during their journey on the Mayflower and once they landed at Plymouth Rock. 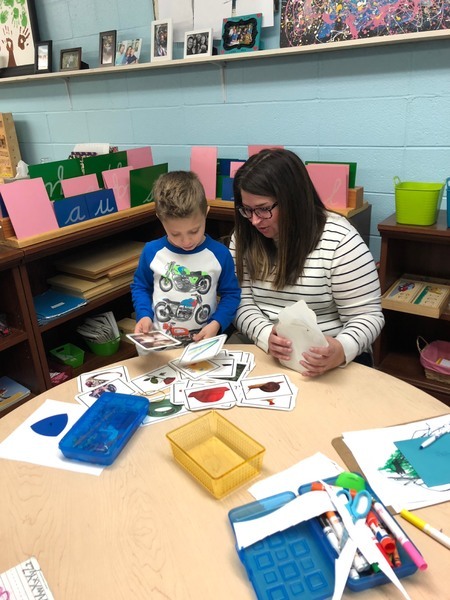 I want to send a big thank you to all the parents who volunteered to bring supplies in to make the Harvest Party a success! 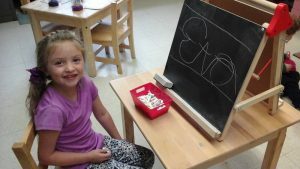 Cursive Chalkboard Writing: This child is practicing writing her name on a chalkboard. She is developing multiple skills involving her eyes, arms, hands, memory, posture and body control. Movable Alphabet: This child is identifying the sounds of the letters ‘j’ ‘k’ ‘h’ ‘l’ ‘i’ and ‘m’ and matching the cursive form to the print form. Movable Alphabet: This child is saying the word of the object and phonetically spelling them: pagin for penguin, wolrus for walrus and asdnut for astronaut. 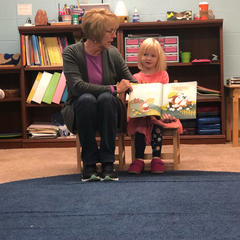 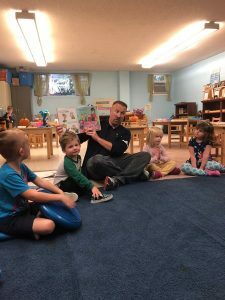 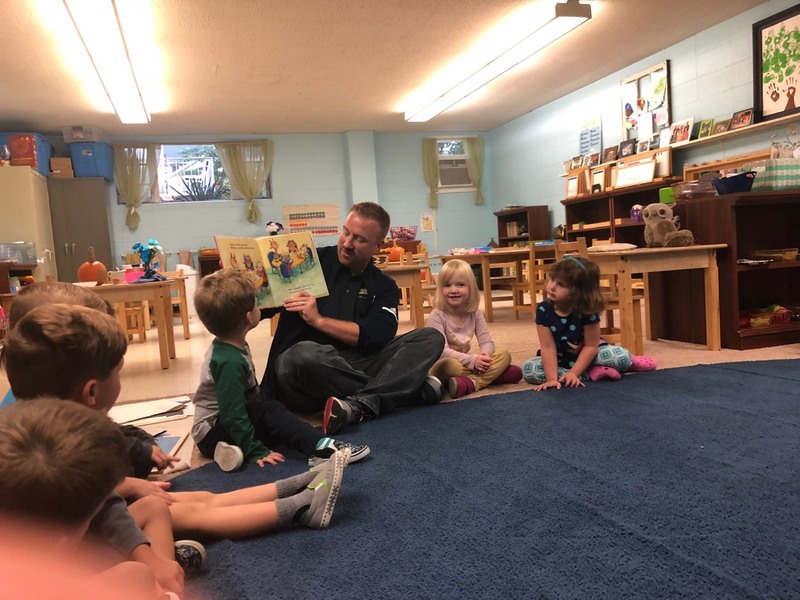 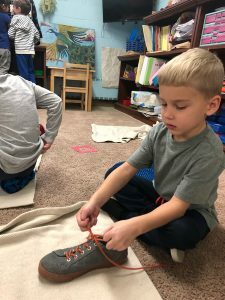 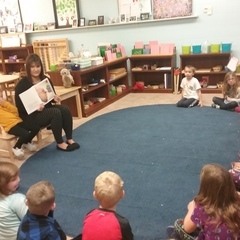 Tying: These children are learning how to care for themselves and are developing a sense of independence while refining their fine motor skills and coordination of movements to successfully tie the shoes. 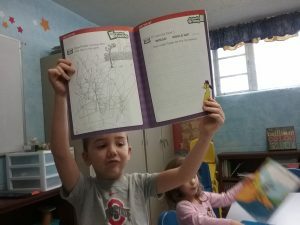 These students are practicing their please and thank yous. 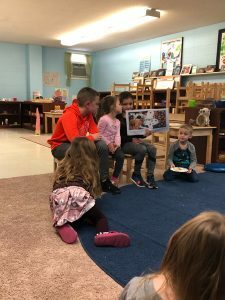 Posted on November 1, 2018 at 5:18 pm. This past week we learned about different body parts. The students learned about the parts we can see on the outside and the parts we can’t see on the inside like our lungs, kidneys, stomach, small intestines, large intestines and heart. They made a model of a lung to keep in the classroom and discovered our anatomy apron and skeleton work. 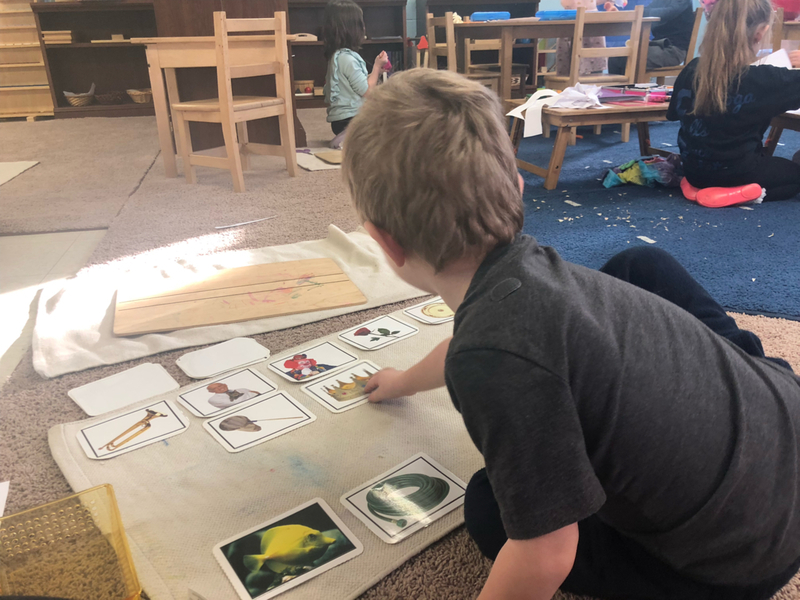 Using these works they enjoyed learning about organs and bones and where each one belongs in our bodies. 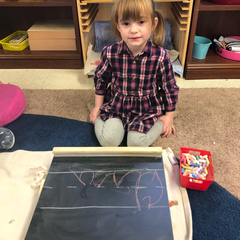 Cursive Chalkboard Writing: This child is practicing writing the uppercase cursive M on a chalkboard. He is developing multiple skills involving his eyes, arms, hands, memory, posture and body control. Sandpaper Letters: This child is tracing and identifying the sounds of the letters ‘m’ ‘l’ ‘e’ ‘w’ ‘p’ and ‘oy’ and connecting the sound with the initial sounds of different objects like log, motorcycle, elephant, web, boy and pink. Movable Alphabet: This child is saying the word of different objects and matching the symbol with the correct initial sound to the object. Posted on October 21, 2018 at 6:07 pm. 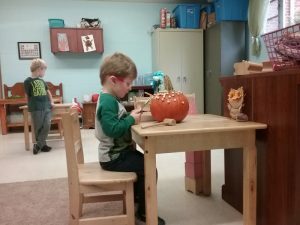 This week we learned all about pumpkins and the different parts like: flesh, pulp, stem, seeds and rind. 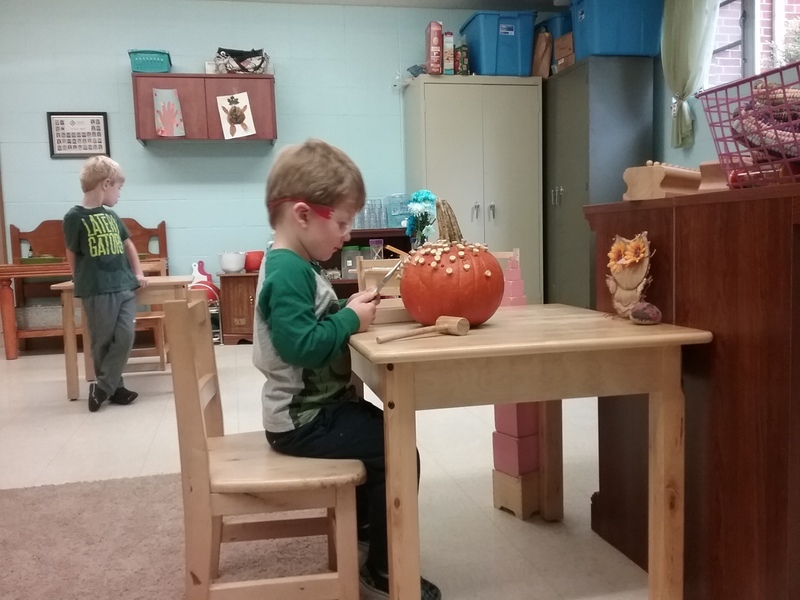 The children were able to explore the inside of a pumpkin by digging out the insides and touching the seeds and pulp. The children also created a venn diagram of apples and pumpkins. Cursive: This student worked really hard to successfully write the first two letters of her name on the chalkboard. Addition: This child is using the golden beads to discover that when you put two small numbers together you get a larger number and that this process is called addition. 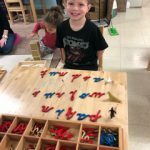 Spindle Box: This child is matching the correct quantity of spindles to each numeral symbol. 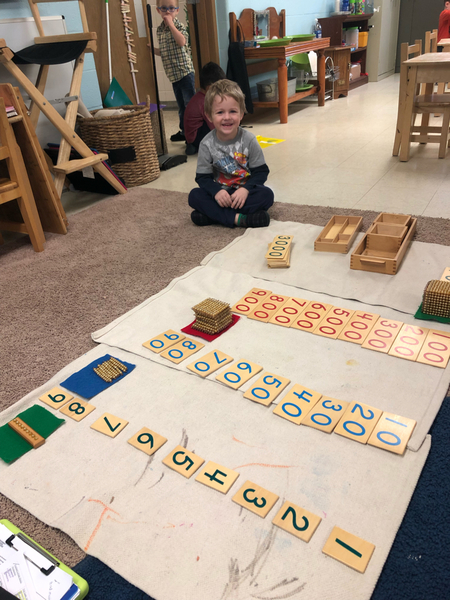 He is also being introduced to the concept of zero and what its symbol looks like, while also seeing the natural sequence of the numerals.